Students who successfully completed the course at the certificate level in Purchasing and Supply run by Logistics Bureau Asia (LBA) received an awards for their achievement. 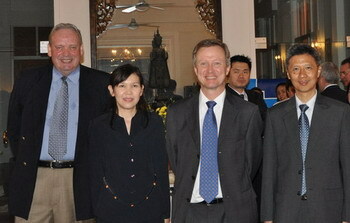 The awards were presented at the ceremony by the British Ambassador to Thailand, H.E. Quinton Quayle. Students were also congratulated by Mr Colin Airdrie, Khun Prapas Chinskul, and Dr. Patcharee Boonyathan of Logistics Bureau Asia. Logistics Bureau (Asia) has been appointed as tuition provider in support of the programme of professional qualifications offered by the Chartered Institute of Purchasing and Supply since 2008.